It is human nature to over-think and critically analyze things before making a purchase online. We all wish to grab the coolest products at the most affordable rates. With unfathomable advancements in technology, we have a huge world market offering infinite products, varied in quality and usage. Similar is the case when you are looking for a reliable, cost-effective pair of binoculars. However, the process of choosing the best binoculars under $500 can be overwhelming. There are way too many options, and this can put you off even before you start your research. This is why I will help you by compiling a list of best binoculars for $500. The applications of binoculars include but are not limited to, land surveys, bird watching, geographic data collection, hunting, range finding, military services, astronomy, and sightseeing. Contrary to popular belief, it is not necessary to have a sky-high budget to land yourself an authentic, infallible pair of binoculars, bundled with the latest features that go hand in hand with your needs. Read on further to learn more about the best binoculars in the market, available for a modest budget of $500. While using a camera, we sometimes face the problem of unwanted glares. We are glad to inform you that with the advancement of technology, we now have binoculars with features that overcome this problem. Multi-coated binoculars are perfect for the reduction of those unwanted glares and help in maximizing the light transmission. But one thing to be kept in mind is that a majority of binoculars under $500 are not fully multi-coated. A majority of people don’t know what this term signifies and hence tend to ignore it. However, this is considered to be the most important feature for people with spectacles. The eye relief is the distance between the eyepiece and your eye. It reflects the comfort zone of a binocular. Minimum eye relief of 14 mm-15 mm is required for glass wearers. Ideally, you should look for binoculars that have 16 mm-18 mm eye relief. Hence more the eye relief, the more suitable it is for glass wearers. What is important for you to know, is that all binoculars ranging from $500-600 have an eye relief of 15mm to 17mm. The field of view a binocular is measured in relation to a 1000 yards of distance. To break it down further, it is the width of the area which can be viewed through an eyepiece. This implies that the larger the field of view more will be the area visible to you through the binocular. An important thing to keep in mind is that the field of view decreases with an increase in magnification. 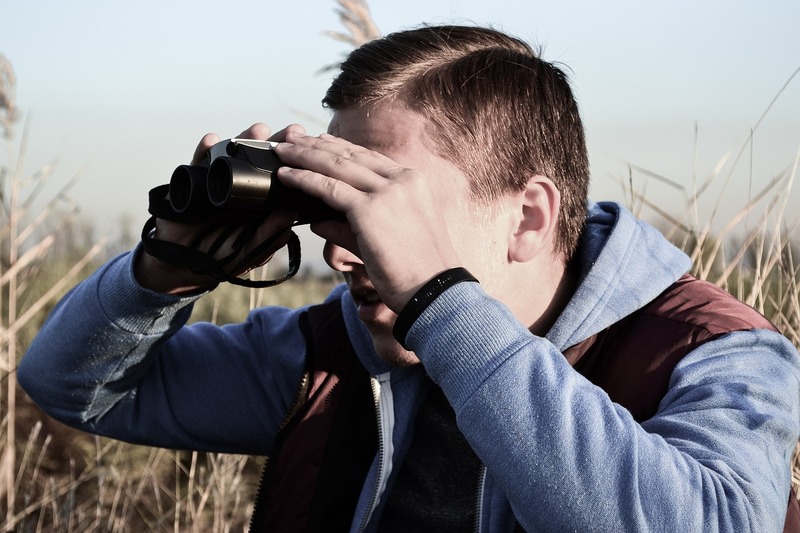 Thus, it is best to opt for a binocular with 8x magnification and 42 mm lens, as it complies with the requirements of all hunters, shooters and adventurers alike. Upon further study of binoculars ranging from $500 to $600, we find that the field of view offered is approximately 300 feet. Binoculars are available in varied sizes ranging from ‘full-sized’ to ‘compact,’ and further, research shows that binoculars under $600 are full or mid-sized. Full-sized binoculars have a configuration of 8×42 or 10 x 42 whereas, the mid-sized binoculars have a configuration of 7×35 or 10×32. Experienced users are all of the opinion that full-sized binoculars are better performers and best suited for bird watching and hunting, but sadly these are heavy and can bog you down on long trips. You will even face the inconvenience of having to carry a tripod on these long journeys. On the contrary, mid-sized binoculars are lighter and comfortable for long trips. Conventionally, we believe that bigger is better, but this isn’t the case with binoculars. It is said that a magnification of 7x to 10x is sufficient for hunting, shooting, bird watching and all related activities. If you opt for higher magnification then the steadiness of the image is compromised, distortion occurs, and the task of manually focusing becomes tough. Another hassle when we talk of these highly magnified binoculars is the tedious task of carrying a tripod. Furthermore, the problem with zoom lenses is that the manufacturers don’t usually make them waterproof; thus inviting problems during water adventures and moist environments in general. All in all, it is advised for a traveler to take up binoculars with 8x to 10x magnification. The objective lens is all about keeping it convenient enough to have a clear view. A lens of 40mm is considered to be light and perfect for night travels and for crystal clear images. Any lens under 30mm is unsatisfactory, and anything above 40mm might get heavy. To sum it up, the basic idea is to choose the right lens which suits your pocket and needs. There are two different kinds of prisms available in binoculars: Porro prism and Roof prism. Porro prisms are considered superior in terms of the light they emit, but the biggest disadvantage they have is the fact that these require a huge body just to emit bright light. Thus, the binoculars housing these prisms become extremely heavy and require the use of a tripod. Whereas, the roof prism is considered more utilitarian as these are light-weight, have slimmer body type and come in direct alignment with the eyepiece. And thus it gets difficult to say which works better or is the best. In all the best way of choosing amongst the two is on the basis of your requirements. The type of focus differs in all kinds of binoculars. Broadly, there are two categories: Individual focus and Centre focus. If your work requires you to have a long distance range, then individual focus binoculars work the best. On the other hand, center focus binoculars are great for a distance of less than 30 yards, where the individual focus fails to deliver. In all the individual focus binoculars are great for the durability they offer, and rugged use as these are waterproof, without any external parts and are even used by the military. Apart from these, other important things that you can look out for, to ensure the best view include the optical coating, image quality, rubber coating, waterproofing, accessories, cost, recommendations, brand and country of origin. These all are extremely crucial because they will determine the life and efficiency of your binoculars. Now let us discuss some of the best binoculars under $500 you can opt for, that lie within the purview of $500 to $600. The Vortex Viper is a perfect fit for your budget. 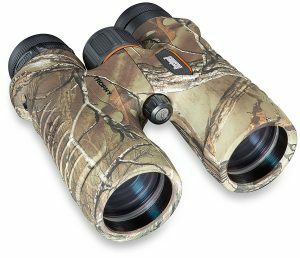 The binoculars come with a 10x magnification and a 42 mm objective lens which is great for bird watching, shooting games and hunters. It is a light-weight binocular of just 1.53 lbs. Other specifications include a field of view of 319 feet in relation to 1000 yards; the exit pupil is 4.2 mm, eye relief of 16.5 mm, an Extra-low Dispersion glass which is great for high resolution and color fidelity. Also, it comes with an anti-reflective coating for bright and glare-free pictures and increased light transmission. It comes with a roof prism, rubber armor, and waterproof optics. Speaking from personal experiences, a majority of the wildlife photographers love the Vortex Viper for its image clarity and ruggedness. Nikon is a great brand for all the accessories related to photography. And coming to its 7549 model, it has a magnification of 10x, objective lens of 42 mm, real angle view of 6.7, central focus, a field of view of 288 feet, 18.4 mm eye relief, close focus of 7.8 feet, 21.6 oz. weight, roof prism, and Extra-low Dispersion glass lenses. In all, the binoculars are great for close focus and far away focus, thus giving you a great package. The binoculars come with sliding rubber eyecups, eco-glass multicoated with dielectric for high reflection and is also waterproof. The binoculars are available in three different magnifications: 8×42, 10×42, and 12×42. The company also has excellent customer service and ensures customer satisfaction with minimalist repair charges and shipping charges. The Carl Zeiss binoculars are considered to be outstanding and are available at an affordable price. 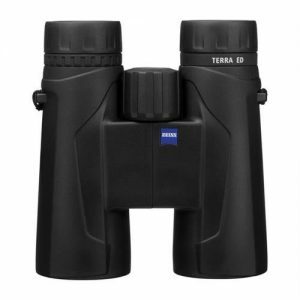 Its TERRA ED binoculars have a configuration of 10×42 and are ideal for a close-up experience. The binocular is light, robust, compact and waterproof. Speaking of its specific configurations, it comes with a 17 mm eye relief, a roof prism of BAK-4 quality, a field of view of 115 feet, and weight of 759 grams. 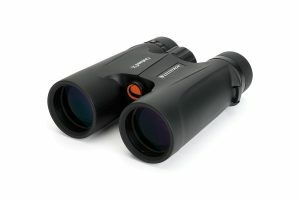 The binoculars have a great design which makes it look attractive and rigid and doesn’t require any external batteries. The use of the hydrophobic multilayer coated Schott ED glass ensures outstanding visuals and clarity. It is purged with nitrogen to make it waterproof and fog proof. 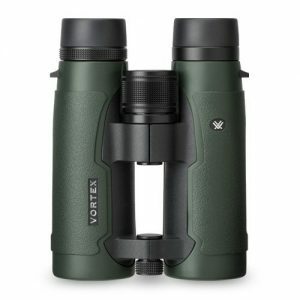 The Vortex Optics Talon HD comes with a 10x magnification and a 42 mm objective lens along with a roof prism. Its exit pupil is 4.2 mm, the field of view is 348 feet, has a close focus of 6 feet, the angular field of view is 6.6 degrees, eye relief of 16 mm, and weight is 26.5 ounces. The package comes with an eyepiece cover, covers for the objective lens, neck strap for safety and convenience, and a carry case for travel. Along with this, it comes with an unconditional lifetime warranty. The multi-coated lens is helpful with the transmission of light for a fruitful visual. Its best feature involves a phase correction coating which enhances the resolution and contrast of the visual. 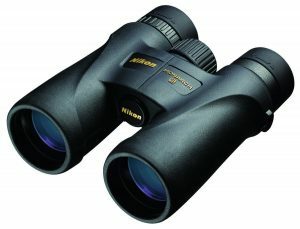 Nikon 7577 Monarch 5 is a 10×42 binocular with an ED (Extra-Low Dispersion) lens. It too has optics which if fully multi-coated, simultaneously with a Roof prism. Despite the fact that the cost of this prism binocular is much greater when compared to Nikon’s alternative binoculars, hunters and adventurers opt for this as it has some notable features. The best feature of these binoculars is its highpoint design and eye cups in front. Customers often laud the high-quality glass, tripod flexibility, weatherproofing and high-quality coating on the binocular. Overall, this is surely a great buy which fits your budget. Bushnell makes the finest binoculars for adventure activities at long ranges. The binoculars come with multi-coated lenses which expedite the transmission of utmost amount of sunlight and even has an advantageous eye relief consisting of a 2 step twist-up regulation procedure for convenience. It even has a focus latch in the center which is used to regulate the focus and may be used even while wearing gloves. Apart from this, it is encapsulated with a non-slip, soft, rubber armor which prevents slipping, mist, and undesirable shocks. Other features consist of a flip-up cover, re-adjustable knobs for an extended manual usage, and the fog proof feature. Nikon Prostaff 3S is one of the best inventions by Nikon, having a silver-alloy coated roof prism and an anti-mirror image multi-coated optic structure. These configurations make sure that the visuals are silvery, clear, and of its true colors. Its light gathering capacity is considered to be of significant use as it gives the viewer a much broader picture of the landscape. People who choose this for bird gazing will be joyful to know that the binocular doesn’t leave you out on anything, owing to its 63˚ wide apparent angle of view. The weight of this prism binocular is 1.75 lb. 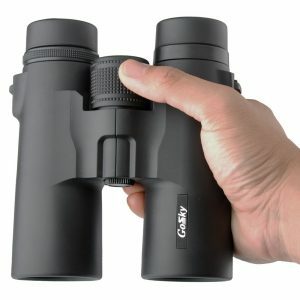 Gosky Binoculars have a solid roof prism in conjunction with 307 feet/1000 yard of the field of view. These work great during outdoor activities like backpacking, driving, hunting and other such activities. It comes with high-quality optics of 42 mm which is enhanced with a full multi-layer coating of the green objective lens. Also, it has an 18 mm blue film eyepiece which ensures the most important features of the design i.e. brighter, crisper, and clearer views. The binocular can withstand harsh temperatures and climatic conditions with the help of its rubber shield, which even helps reduce the chances of shocks. The kit comes with a carrying case, lens safeguard and eyepiece covers, neck harness, and a cleaning cloth. Along with this wholesome package, it comes with the Gosky 2017, which is a smartphone mount and can be connected with a majority of the Cell phones. In all, the product is guaranteed to give you a great experience, but the fact that they are a little overpriced steals its first place from the customer’s choices. 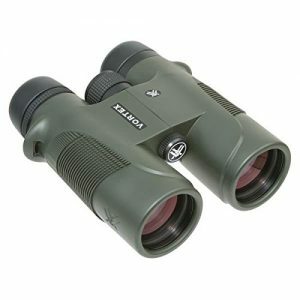 Simmons ProSport is a 10×42 binocular with a roof prism helping you connect with far-reaching places easily. It comes with multi-coated optics and a BAK-4 prism. 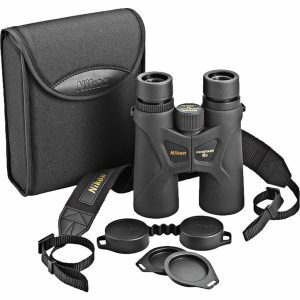 These are the most well-known, waterproof binoculars with a great body which has a raw and rugged feel. They can be handy and comfortable for people with eyeglasses because the eye relief is 16 mm. In addition to this, it comes with purged nitrogen, soft rubber armor coating, great grip and also a tripod adaptor. The only thing undermining this product would be the feeble Velcro case, as it doesn’t provide any safety to the binoculars. 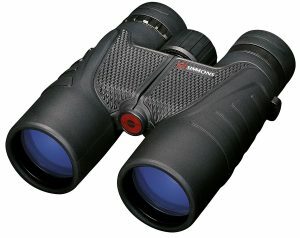 Celestron X 10×42 Binocular is an all in one binocular which works great in all unfavorable environments. The excellent lenses have been prepared to provide the best of magnification and color coordination. 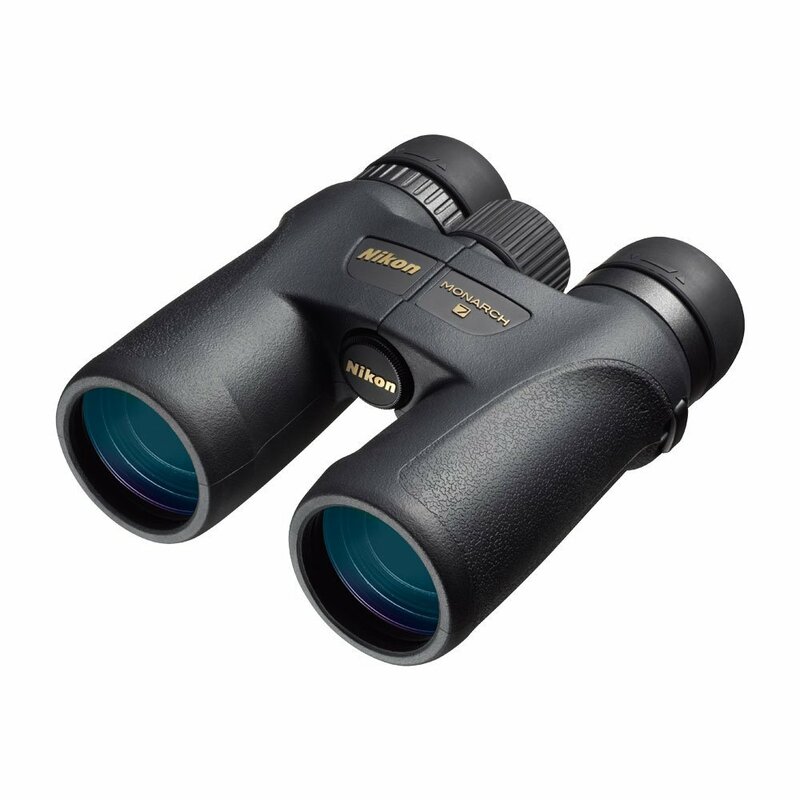 This binocular is available in three different sizes: 8×42, 8×25 and 10×42. The product can even be used underwater and wouldn’t corrode in the sea water, air and moisture. It is very handy for sports spectators because of the ergonomic design which makes the hold and use very relaxed. Speaking of the pros, the binocular is incredibly lightweight, presents a crystal clear image, prices are in line with quality, and the size is very user-friendly for hikes. On the other hand, the cons of buying this binocular include the undeniable fact that this doesn’t do wonders at night, the rigidity of eyecups makes it uncomfortable for use and it isn’t recommended for those with big eyes. In the end, we would like to tell you that all of the above-mentioned binoculars are a steal if you are on a crisp budget of $500 to $600. They come jam-packed with all the necessary requirements to ease your travel and give you a great time. 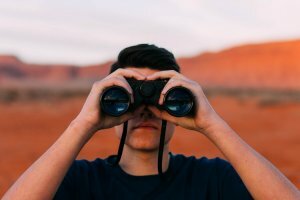 The best way of choosing the best binocular for 500 would be by researching and reading a lot before arriving at a decision. Guaranteed this process might become long and exasperating but strive until you find the best option for yourself, in accordance with your budget and needs. Furthermore, you can delay your buy for a few weeks if there is an upcoming seasonal sale, as this will definitely help you buy a better binocular at a discounted price.